For those of us who loved the 'Sim Cough Drop' mod by TigerM which stopped the sims doing that awful coughing/choking every time they ate, but find that it now conflicts with World Adventures (where it stops sims from drinking nectar or eating Chinese food), Pets (it kills the 'Throw Scrap' action) and Supernatural (it interferes with the werewolf eating animations), here is a mod that can be used with World Adventures upwards. As Tiger has retired from simming, I hope you'll find this one useful. It is compatible with Awesomemod and with any mod that doesn't affect or modify the animation script for 'eating' actions. 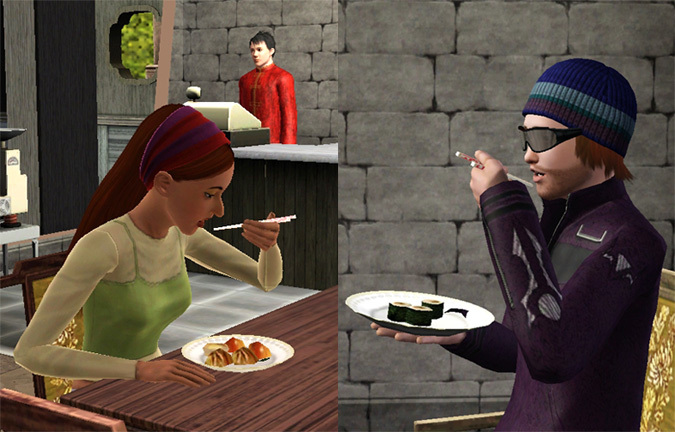 Now your sims can eat Chinese food, AND not choke half to death while eating. They can also happily drink nectar (maybe a little too happily, judging by the numerous glasses below). And in the Supernatural version of the mod, werewolves can eat as animalistically as they're supposed to. At least they won't cough while they do it! NOTE: The Downloads Tab contains a series of different ongoing versions of the mod - please choose the right one for your patch and/or expansion level. If you use an earlier version of the mod than the one that coincides with your latest expansion, you'll get jump bugs related to that expansion - for instance, if you have Pets but use an earlier version of the mod, if your sim tries to to throw scraps to a pet at the dinner table, the sim will jump to the middle of his/her chair instead. Thanks for looking, hope you'll find this useful.